I love how u drew dis out , deze 2 are my favoritez in the DN series and Manga , its a shame dat Light dies in vol.12 and L dies < though IDK how he getz killed >BTW : Did u kno that they made 2 DeathNote movies ? 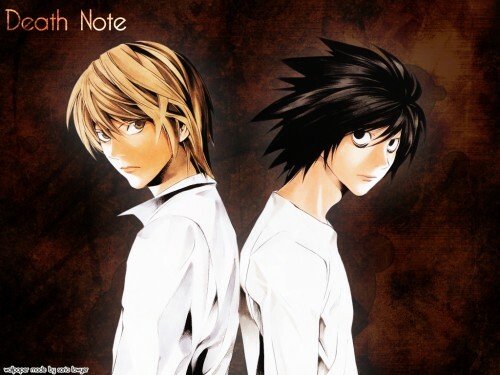 If u go on2 Google.com and type in da DeathNote the movie you'll get alot of different sites . It's awesome! I love DN, even though it made me really depressed. I love L! And Light! And Raye Penber xD Just because of his name. The background looks so cool. XD This wall looks very cool! i like it ^^ really cool! sooo hate kira! omg! why didn't he die first!